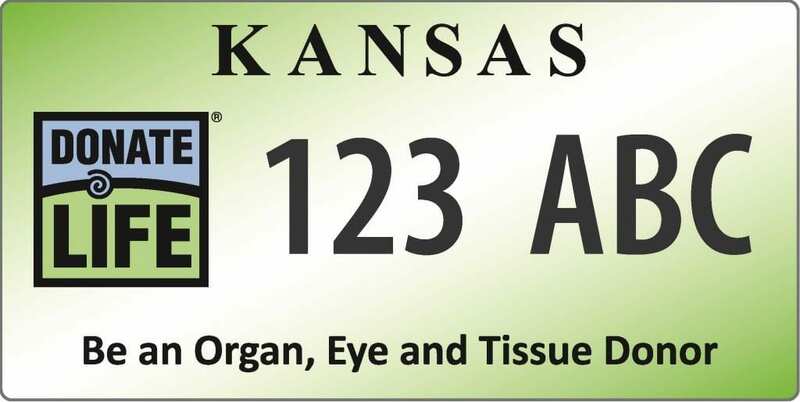 Show your support for organ, tissue and eye donation with a Donate Life license plate. These uniquely designed plates are a wonderful way to honor those who have chosen to give the gift of life through organ donation. By purchasing a Donate Life License Plate, you can help spread the word about the need for organ donation and raise funds for future education in the area. All proceeds are tax deductible, and all proceeds will go toward education and awareness initiatives in Kansas and Missouri. 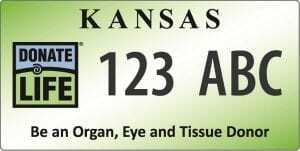 To order a Kansas Donate Life license plate, please visit your county treasurer’s office. The cost includes a one-time payment to your county and state for plate registration fees, as well as an annual donation of $40 to Midwest Transplant Network. In Kansas, personalization of the specialty plate is not available at this time. 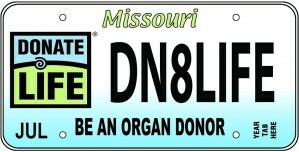 To order a Missouri Donate Life license plate, please visit the Missouri Department of Revenue for detailed instructions. The cost includes applicable plate registration fees, as well as an annual donation of $25 (or a bi-annual donation of $50) to the Organ Donor Fund through the Missouri Department of Revenue. In Missouri, your Donate Life license plate must be personalized. You can check the availability of your personalized plate here.